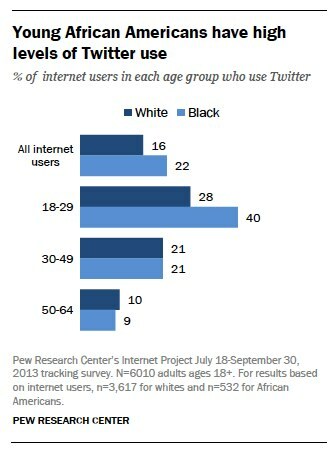 Twitter has long been especially popular with non-white users across the U.S., and a new study from Pew Internet suggests that this trend continues, with use of Twitter increasingly popular amongst black users, particularly the key 18-29 year-old demographic. Pew surveyed more than 6,000 adults across the U.S. and discovered that more than one in five (22 percent) of African American internet users are active on Twitter, compared to just 16 percent of white users. Moreover, Twitter is especially relevant to 18-29 year-old black users, with 40 percent active on Twitter (against 28 percent of whites). 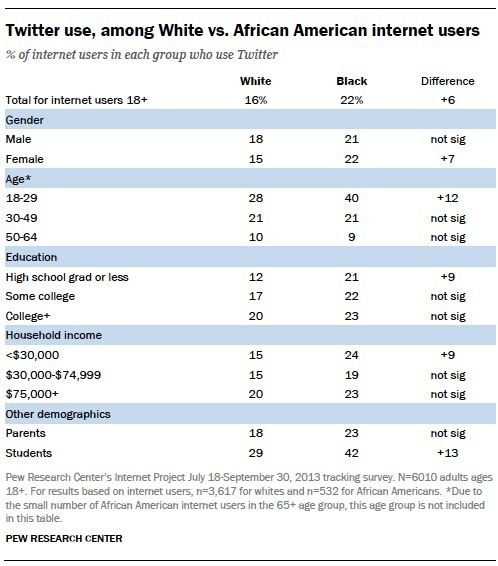 Overall, 73 percent of back internet users have a presence on at least one social network, versus 72 percent of whites.